The holiday season in St. Louis begins with the St. Louis Thanksgiving Day Parade held in Downtown St. Louis. Floats, large balloon characters and of course Santa, can all be enjoyed by young and old! Going to a special Christmas concert or performance at the Stifel Theatre, the Sheldon, the Fox Theatre or Powell Symphony Hall will put anyone in the holiday spirit. Care for a Winter's night drive? There are several area parks that put on amazing Christmas light displays. One Christmas light display called "Winter Wonderland" can be found at Tilles Park in St. Louis County. Another beautiful display is found at National Shrine of Our Lady of the Snows in Belleville called "The Way of Lights". Jellystone Park Resort in Eureka puts on a pretty spectacular Christmas light display as well called "Santa's Magical Kingdom". The "Christmas Wonderland" light display can be found at Rock Spring Park in Alton. Others are the "Celebration of Lights" in Fort Zumwalt Park in O'Fallon Missouri and the "Holiday Night Lights" in Rotary Park in Wentzville. 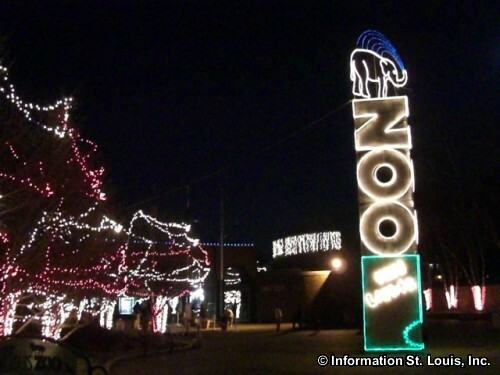 The St. Louis Zoo gets into the Christmas spirit by being open during special evening hours for their holiday lights display called "Wild Lights" which begins the Friday after Thanksgiving and runs thru December 23rd. There is an admission fee at most holiday light displays. For a pretty sight that is free, take a leisurely drive Downtown through the Anheuser-Busch Brewery which is always lit up for Christmas and then by Kiener Plaza to see the St. Louis Christmas tree and the surrounding downtown area all lit up for Christmas! 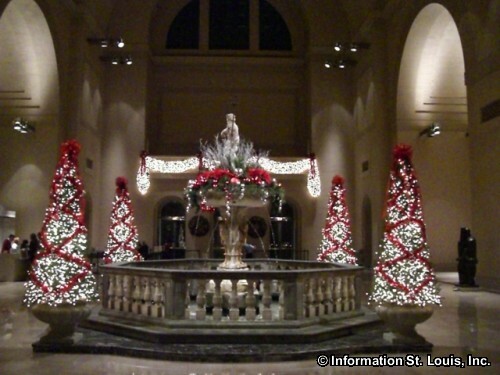 The Jewel Box in Forest Park puts on a "Poinsettia Show" the entire month of December. The art deco styled greenhouse is beautifully decked out with Poinsettias in every color and can be toured everyday of the week for only a $1 or get in FREE on Monday and Tuesday before noon. 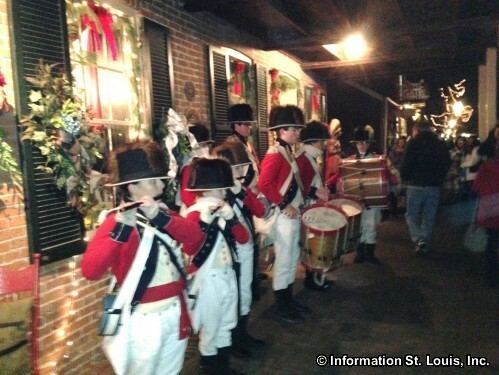 Historic St. Charles gets all dressed up for Christmas in a very traditional way! In December, the city puts on a month long Christmas Festival called "Christmas Traditions" which is a group of actors that act out the traditions of Christmas, from the Sugar Plum Fairy, to Carolers, to Father Christmas, all on the streets of Historic St. Charles. Another traditional holiday celebration can be found at the Old Courthouse beginning the weekend after Thanksgiving and on the next several weekends in December up until Christmas. The Courthouse is decorated in a Victorian holiday style and visitors are treated to holiday music, cookies and drinks. What better way to end the holiday season than by ringing in the New Year! St. Louis hosts an annual event called First Night. First Night is held on December 31 and is a family orientated event where kids as well as adults enjoy ringing in the New Year.